Every year, my son’s aide makes me a Father’s Day card. She carefully cuts, colors, and shakily writes out “Happy Father’s Day” with what I assume is her non-dominant hand. Then she signs his name and sends it home. Sometimes he’ll tap it twice with his hand to show that he remembers it. Sometimes he won’t. Regardless, I open it wide and balance it on my dresser for all to see. Truth be told, though, the card isn’t important to me at all. It’s for the world to smile at as they walk by, but it means little more. As the father of a nonverbal six-year-old with autism, I learned long ago that cards and presents don’t show me how my son feels. Before anyone gets too sad over this fact, keep in mind that the pendulum swings both ways. Lucas cares even less about receiving gifts than he does about giving them. No matter how much he eventually grows to love whatever is behind the wrapping, he hates the idea of opening it. When we do eventually tear the paper off, even if it’s something he really wants, he will walk away in favor of a toy he’s more comfortable with. This disinterested approach to gift-giving has left many a relative and family friend with a glazed stare of confusion. For a while, we would offer excuses or try to coax him into coming back. It’s funny, because every holiday season, we’re bombarded by movies with morals urging us to show love above anything else. Presents are presented as secondary to kindness and friendship. Yet, during those same movies, we’re further bombarded by commercials telling us that good kids get toys, good women get diamonds, and good men get Sports Illustrated. When it comes to Lucas, though, that old moral holds true. Unlike relatives who tell you that you don’t need to get them anything for a birthday, he genuinely means it. While we still exchange gifts and cards, it’s almost done out of tradition. Most of the things we give each other on special days are done so that we have an answer when people ask, “What did you guys give each other?” It allows us to reply with a better answer besides, “Hugs!” That one can get you some weird looks. To put it plainly, Lucas’s love and success can’t be hung on the wall. In a house full of his older sister’s artwork, there’s little, if anything, that he has truly made himself. His love doesn’t come attached to construction paper. Instead, it’s measured by things like the time we spend together. Even more so, it’s reflected in all the actions he does with me that he doesn’t do for others. Almost every parent of a special needs child knows what I’m talking about here. They’re the interactions that no one sees but us. It can be a gesture, word, or even a reaction that the rest of the world never knows. Lucas and I have them too. When he was young, I would go out of my way to show everyone the things he would do privately. To me, demonstrating that he could wave or clap his hands at the appropriate part of a song was my opportunity to prove that everything would be OK, despite other missed milestones. I’d chase him around the same way I would when a new present would arrive fully wrapped. Nine times out of ten, he wouldn’t perform. In hindsight, I feel bad that I expected him to. As time went on, though, I began to see these moments for what they are—ours. It’s not about proving anything or showing him off. It’s about us and the fact that Lucas felt comfortable enough with me to do them. It meant that, despite verbal barriers and vastly different views of the world, my son and I ‘get’ each other. He loves me, and I love him. When you have a nonverbal child, the phrase ‘actions speak louder than words’ is never truer. That’s the goal of every dad, and it’s a goal that I’ve reached. Cards are temporary. Artwork fades. The bond I have with my son, who is very selective over who he has bonds with, means everything to me. On Father’s Day, and every day, there’s nothing that makes me feel more like a father than that. James Guttman has been writing for 15 years and introduced https://hiblogimdad.com/earlier this year. 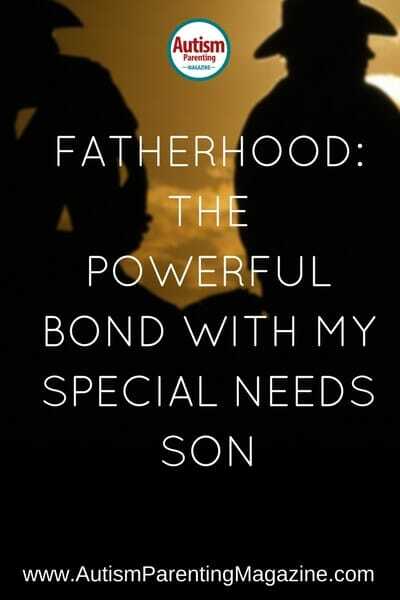 James writes about parenting both of his children (one nonverbal and one non-stop verbal), self-reflection, and all that comes with fatherhood. His mix of humor and honesty aim to normalize the way people view raising a child with special needs and show that we, as parents, are all basically the same, regardless of the children we’re raising. You can like his page on Facebook at https://www.facebook.com/HiBlogImDad/ and follow him on Twitter @JamesGuttmanWWi. I loved this story. My son with autism is far more fascinated with the scotch tape on the wrapping paper than the present itself. He will sit and tear the tape into tiny slivers which can take quite awhile causing the gift givers to eventually lose interest in watching him open anything.